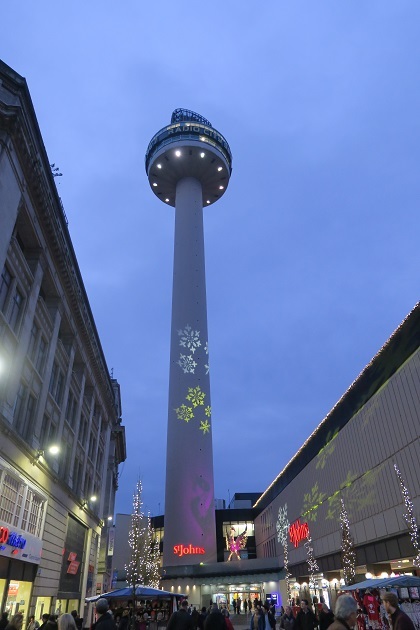 A trip to Liverpool in search of snowflakes was just the thing in that post Christmas pre-New Year time – not the real sort I hasten to add. 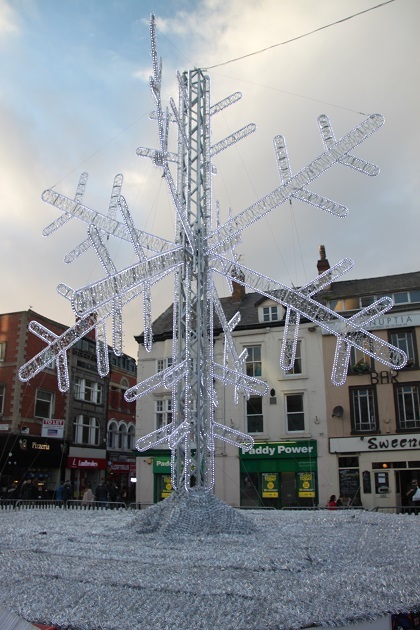 We were seeking twelve fibre glass snowflakes, designed by artists from around the UK and dotted across the city as part of a festive trail. We’d done this last year and loved it so back we went. We downloaded the Snowflake trail before we set off and then map in hand started to check them off our list. All were very eye catching and Son especially enjoyed the challenge of this festive treasure hunt. We enjoyed the fact there was no moaning about the walking but it is also such a great way to discover new and different parts of the city. Lots of quirky stops and interesting spots, it was quite a long walk and just the thing to shake off that post Christmas lethargy. 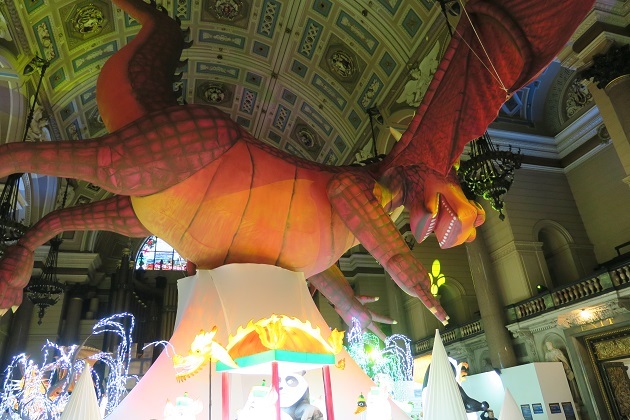 Snowflakes all checked off, it was time to make our way to St George’s Hall and the Dreamworks Lantern Show. I had pre-booked tickets only a couple of days in advance and was concerned about crowds and availability but no problem with either. 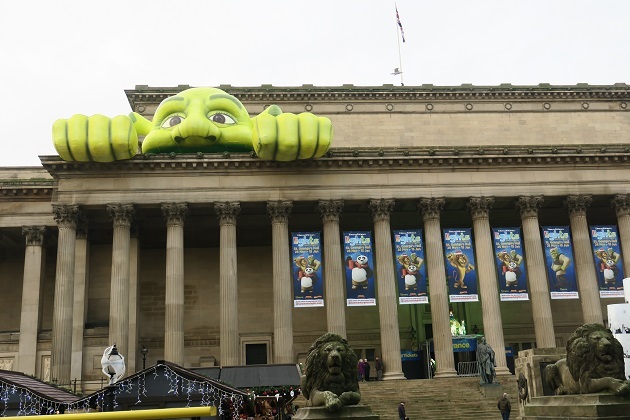 No problem locating the entrance either – that giant Shrek was a bit of a giveaway. 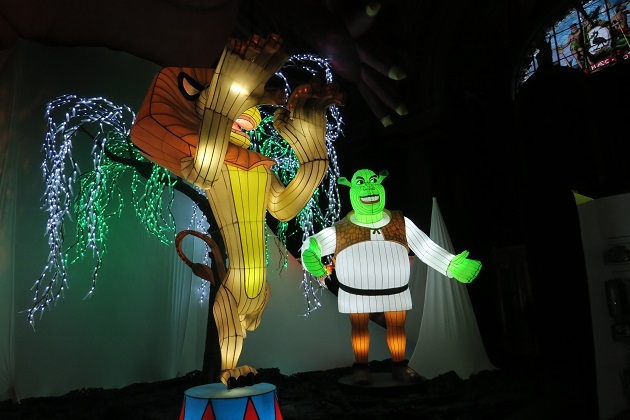 Dreamworks had taken over part of this iconic Liverpool building and filled it with lantern figures from Shrek, Kung Fu Panda and Madagascar. The illuminations start in the entrance hall and you follow a trail through a whole series of rooms. As much as anything I enjoyed the chance to look around this lovely building – it is a wonderful backdrop for the movie scenes, the ceiling is especially beautiful. It only took us about fifteen minutes to walk around and see everything, not the cheapest experience with tickets costing £10 each but Son gave it a mighty thumbs up – success. That’s a coincidence Phil!! It is a great city with so much to see and do – everytime we go we find something different and a new place to explore! What a great idea for a festive trail. Would love to do this one year, Joy. It is fun and a walk with a difference Clare. They’ve done it for the last three years I think, obviously it goes down well! Yikes! A tenner each for 15 minutes of entertainment is a bit galling. The snowflake trail looks fun. I always enjoy those sorts of things as they provide focus (and motivation for kids) for a jaunt around a city or town. Way too expensive – I expected a lot more for my money. Insult to injury as well when we enjoyed the Snowflake Trail so much and that was free!! Excellent images and sharing of the highlights. Thanks for taking us with you. Thanks for coming along!! We had a great afternoon and loved sharing it. What a lovely way to spend an afternoon Joy. 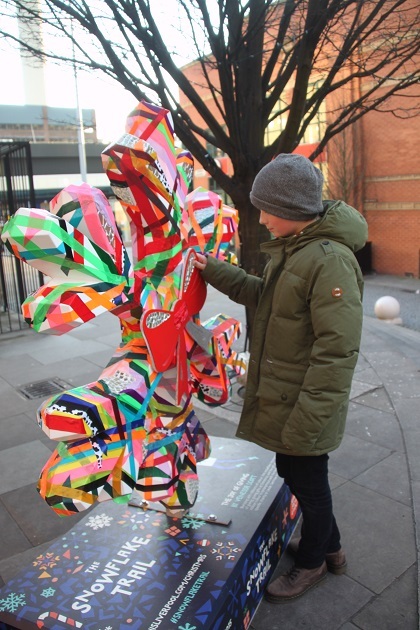 I’d not heard of the Snowflake Trail but it looks a really nice post Christmas activity. We might perhaps do that next year – I don’t seem to get to Liverpool much these days but I love the historic waterfront buildings. Can’t understand the weather today, supposedly warmer but the wind chill makes it unpleasant here. I love the waterfront and those buildings too – my favourite part of the city. The trail has been going for the last 3 years I think and hopefully will continue. It’s a bit of fun but what I liked most was it took us all over the city to different areas we never would have explored or found on our own. I thought exactly the same thing about the weather yesterday, showing reasonably high temperatures but so cold all day long. Today looks more of the same – misty and dull….. dark days of January! 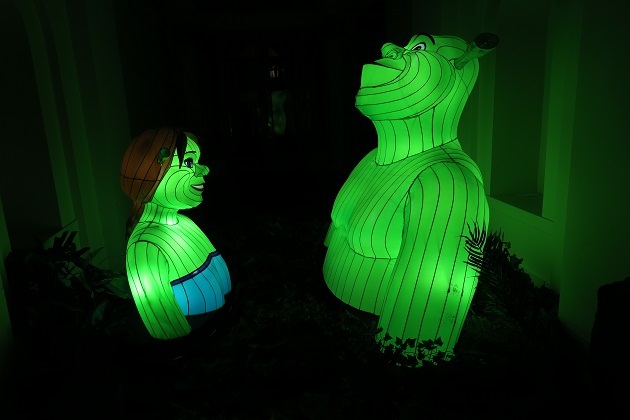 I love these lanterns, this is so pretty ! I hope I will be able to visit Liverpool this year, I’m really intrigued by this city and would love to discover it ! It’s a great city with so much to see and explore. We go reasonably frequently and always find something different to do. This looks so festive and colourful. Obviously ideal for kids, but probably big kids too. Absolutely – we all enjoyed it! We are planning to go to Liverpool for a weekend (we are fans of the tv show Life At The Zoo, about Chester Zoo, and thought it’d be fun to visit). 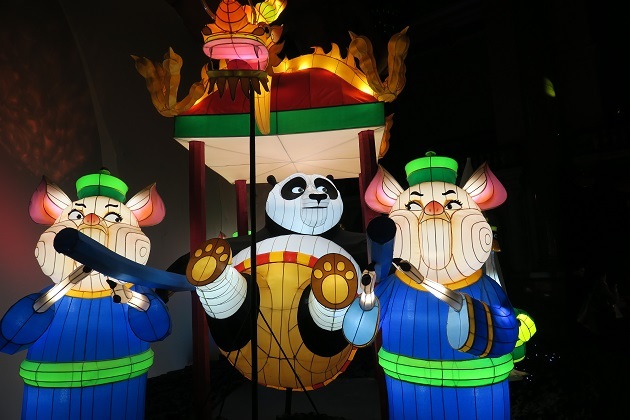 I don’t think we’ll be going in time to see this, but there is going to be a lantern/balloon festival for Chinese New Year here at Chiswick House. It seems like it might be similar. Chester Zoo is great, we hadn’t been for quite a while but went again on the last half term holidays in October. There is a whole new area to explore – you need stamina!! The lantern festival sounds great too. Any trail like that means our son doesn’t complain about how much further there it to go – makes life easier for us!! Finding the snowflakes in different parts of the city was fun though and we did enjoy the lanterns too. A nice thing to do in the holidays! Joy, this looks like the perfect after Christmas trip…I know your son loved it! We all had a great day Pam, it was nice to get out and about and have a treat like this after Christmas for sure. Nice idea, looks like a great day out! 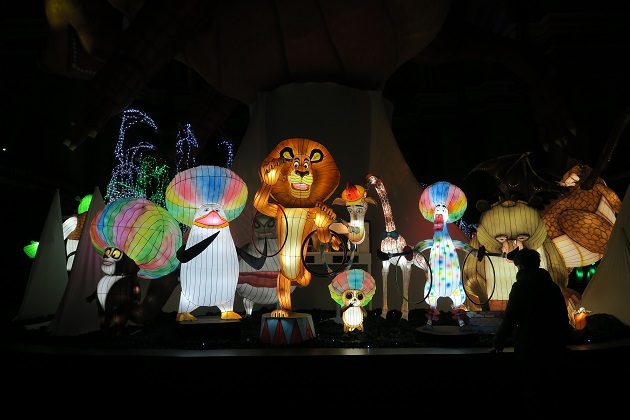 It was fun – despite the steep entrance for the lanterns! 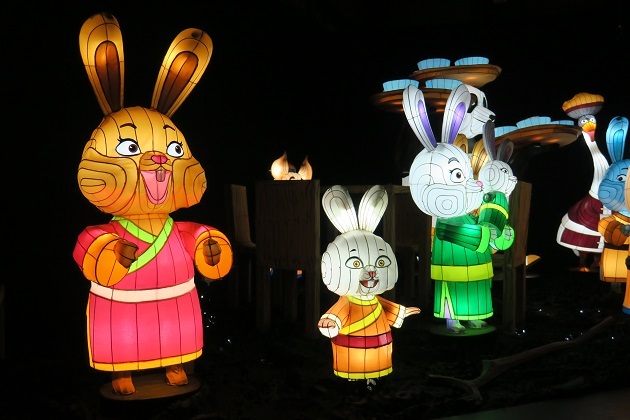 Those lantern figurines looks so fun, what a great day! We all enjoyed it so much – a great walk and then the lovely lanterns, perfect! It was fun to walk around for sure. Oh my girls would love the Madagascar part! Looks cute! It was great – fun and different! 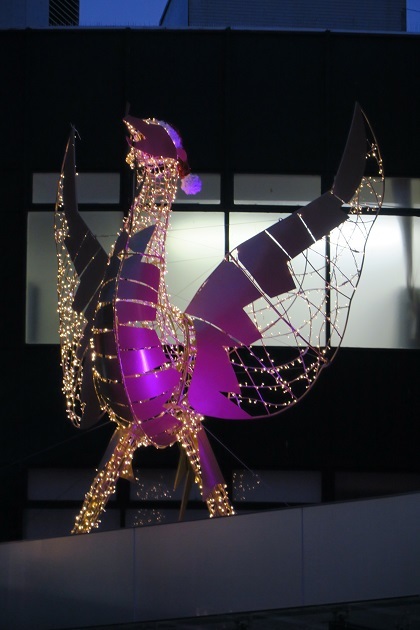 I do love that little Liver Bird, but some of those lanterns are a bit scary looking! Especially those ones I’m assuming are the Seven Dwarfs (I’m not that familiar with Dreamworks films)! Those dwarfs definitely don’t look too friendly!! 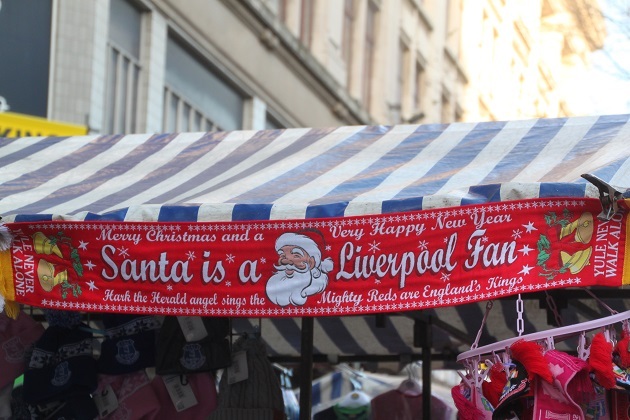 I took a visit to Liverpool just before Christmas, really enjoyed it, got us into the Christmas spirit with all the Christmas decorations and festivities. 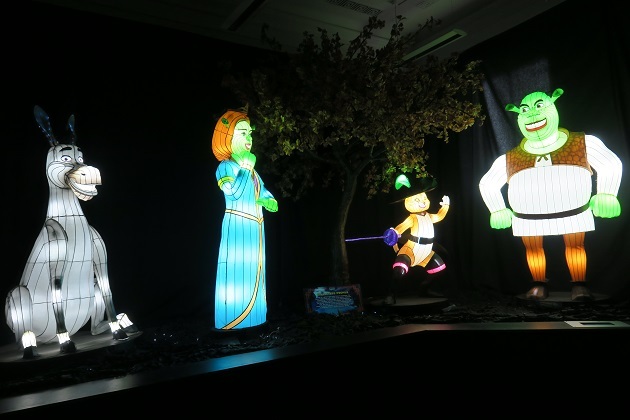 Didn’t visit the Shrek experience so its nice to see inside! 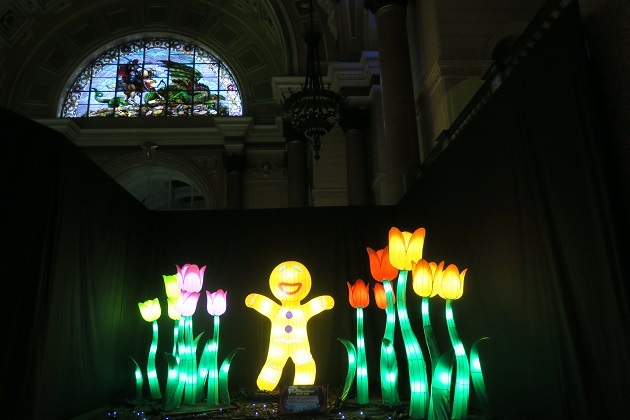 Did you get time to visit the Ice festival at the pier head or Albert Dock, they had a very Christmassy projection show on in the evenings. No we didn’t see the Ice Festival but now I feel we missed out on something!! Hopefully it comes back next year. Although Christmas is far away now, I enjoyed Your and its lovely photos. Snowflake was really huge. 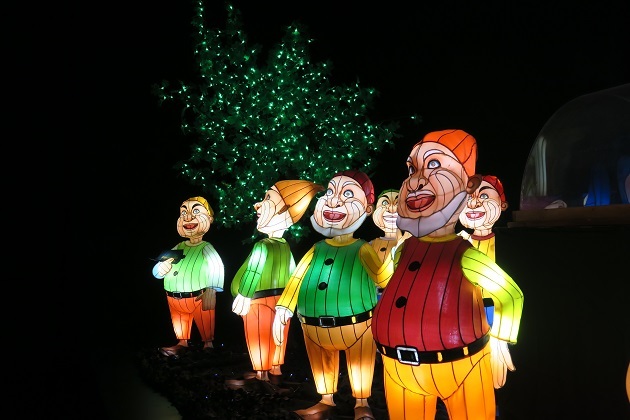 Especially illuminated figures are dear to my heart. Excellent photographing work!